In addition there are shorter desk-top exercises, slide shows, talks and discussions. As well as focusing on permaculture as a design system we also explore it as a guide towards more sustainable living in this time of great change. For more details on the course contents, including a sample timetable, click here. The main tutors are Caroline Aitken -director of Patrick Whitefield Associates and Matt Dunwell -permaculture pioneer and the farmer of Ragmans Lane. Additional teachers include Sarah Pugh -urban and community permaculturist and director of Shift Bristol, Steve Pickup -expert in living willow structures, Carine van Gestel- craftswoman, designer and teacher, Juanfran Lopez -permaculturist working at Ragmans, Christina Crossingham (Patrick’s sister) at Easton Community Garden and legendary permaculture teacher Mike Feingold. The venue, Ragmans Farm, set in the glorious countryside of the Wye Valley, Gloucestershire, has long been noted as a leading permaculture site. 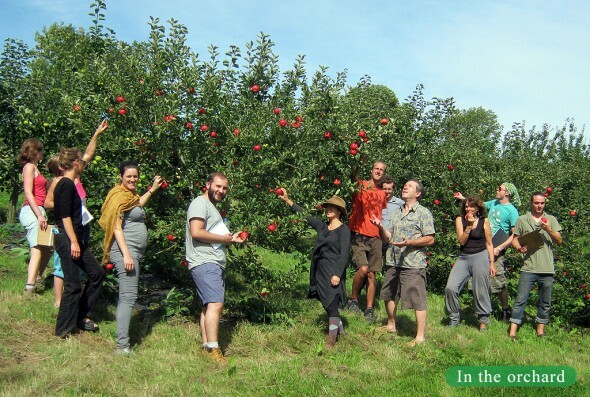 A particularly interesting aspect of their work at present is holistic orchard management, a probiotic approach which avoids the pesticides used in organic orchard management. If using public transport we organise a group taxi collection service from Gloucester Train Station the evening before the course begins. 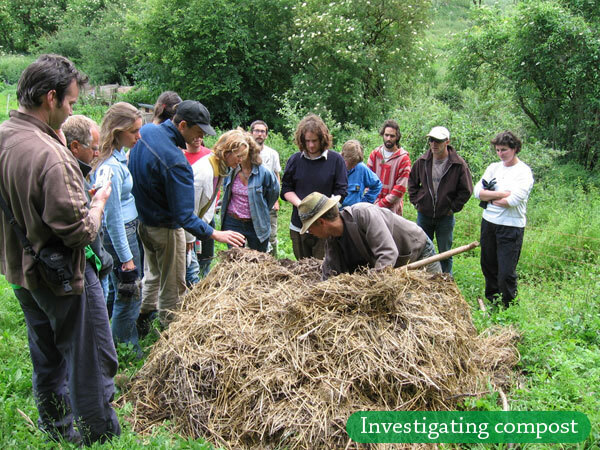 During the course we make a day trip to Bristol visiting several inspiring projects to see permaculture in action in an urban setting. While our courses have a land-focused approach we include something for everyone whether they are in the middle of a city or have land in the country. 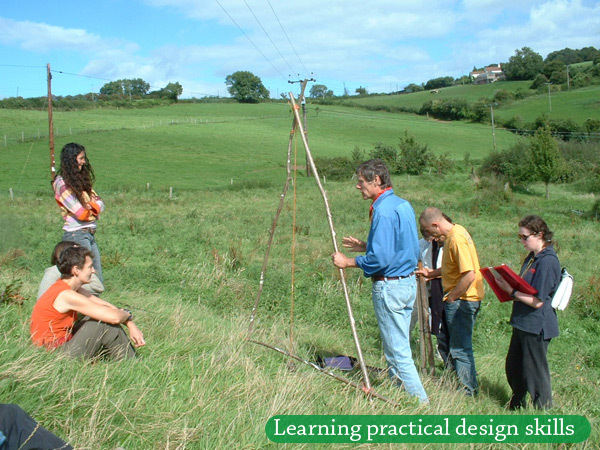 Permaculture principles can be applied to any situation and we provide useful information, practical skills and clear understanding that you can apply to your life and your surroundings. This includes people-care sessions to help us with working in groups, community and in our personal relationships in acknowledgement of the importance that good communication and co-operation have in a sustainable future. The Earth Care Manual, Patrick’s major permaculture book, at discount price. You can order your copy in advance or collect it on the course. Simply choose either option on the booking form and add the cost to your payment: £35 in advance, £30 on the course. Fees cover all costs including wonderful home-cooked meals made from local organic produce (where ever possible); bunkhouse accommodation in a beautiful converted barn or camping with a stunning view and access to all facilities (you choose); teaching and tuition from experienced and inspiring teachers; day trips to educational and inspiring projects; a wonderful experience and learning that will enrich your life! If you are local and won’t need to stay or join us for breakfast and dinner we can arrange a discount for you. Concession rate: £580. Please contact caroline@patrickwhitefield.co.uk to discuss. Click here or contact us by email or phone. We’re always happy to hear from you. This is a comment made using the default WordPress comment feature.